The visitor center at Sutton, WV, will host Bazarre, a forum for authors who specialize in the paranormal Nov. 17, 2018. Five nationally recognized authors who specialize in paranormal investigations will gather November 17 in Braxton County—home of the legendary Flatwoods Monster—for a public discussion of UFOs, hauntings, and the paranormal. Dave Spinks, Stan Gordan, George Dudding, Seth Breedlove, and Eric Altman will be speakers at the forum and meet-and-greet to be hosted from noon until 4 p.m. at the Braxton County Visitor’s Center in Sutton, West Virginia. Five authors are scheduled to speak. 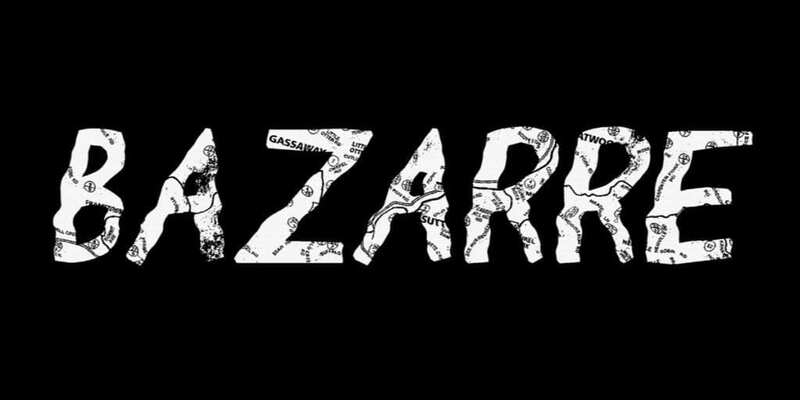 Organizers intend to grow the event, titled “Bazarre,” a portmanteau of bazaar and bizarre, into an annual celebration of the paranormal, for which the center of the state is known, according to Andrew Smith, executive director of the Braxton County Convention & Visitor Bureau. “The visitor’s center was first approached by Nicholas County resident and paranormal investigator Dave Spinks to organize a book signing for his latest work,” Smith said. Braxton County may best be known among fans of the paranormal as the home of the Flatwoods Monster, a being alleged to have crash-landed a spaceship on a ridge near Flatwoods, West Virginia, in the 1950s. The legend has recently enjoyed a resurgence in popularity with the release of the Fallout 76 video game, in which the monster is featured as an antagonist. Smith said the region has witnessed an uptick in tourism in recent months as a result. Several other legendary West Virginia monsters are featured in the game, including Mothman and the Grafton Monster. 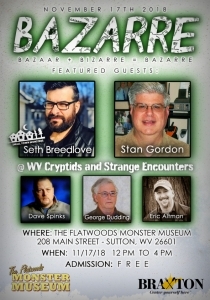 Admission to Bazarre is free, Smith said, and speakers will discuss other paranormal events and beings associated with West Virginia, including local hauntings and the appearance of other cryptids such as Bigfoot. Smith said the Bazzare is an ideal occasion on which to purchase hard-to-find books and movies authors have produced as gifts for the Christmas season. Stan Gordon was the primary investigator of a UFO crash-recovery incident that occurred near Kecksburg, Pennsylvania, on December 9, 1965. He has appeared on many TV shows, including Sightings, Inside Edition, Creepy Canada, A Current Affair, and Unsolved Mysteries. Seth Breedlove is the man behind Small Town Monsters, an Ohio-based film production company that has produced many documentaries based on strange occurrences. Breedlove’s sixth film, “The Flatwoods Monster: A Legacy of Fear,” debuted in Sutton. George Dudding holds degrees physics and mathematics and has authored more than 47 books on topics such as UFOs, cryptids, monsters, and the paranormal. Dudding has appeared on Darkness Radio and the Mothman of Point Pleasant. Dave Spinks has conducted hundreds of investigations, including hauntings, reports of strange creatures, and UFO encounters. Spinks has been a prolific content creator since 2011 and has appearing in many TV shows and documentaries. Eric Altman is a bigfoot investigator and director of the Pennsylvania Bigfoot Society. In 2016, he launched the Pennsylvania Cryptozoology Society, a volunteer research group that investigating claims of sightings and encounters. He is the host of BTE Radio. Did Poe write “The Raven” while visiting Saint Albans, W.Va.?